Sometimes I do my makeup in the mornings and don’t get around to photographing the products until later in the day (sometimes even days after) so I apologize for the impreciseness of my quick FOTDs. 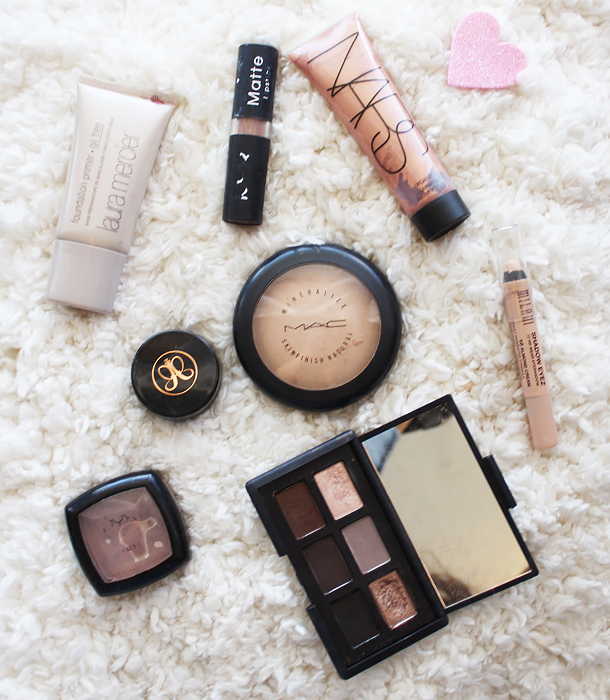 I tend to forget which products I used when it comes to basic items like mascara and sometimes even blush. Oops. Still, I hope you enjoy these! This look is so gorgeous, it's very flattering all around. That Nars illuminator looks interesting, may have to look into a sample of that ! That lip color on you is very flattering ! Love this look, it looks so natural and the lip colour looks very lovely! That eye palette is so buff! You look flawless. I love this look on you! This is such a gorgeous look! That Nars palette looks so pretty. Do you use the illuminizer over your foundation? Dayum girl! Your brows are looking hella amazing, and that nose ring is badass! I love the Nars And God Created the Woman palette, it's just perfect! Fab look and you use some amazing products. Keep hearing great things about the Armani foundation. It looks great on you! flawless is not the word! thats it, I MUST try Gorgio Armani's foundation! This looks so damn good on you!